Guys, last week I did a three day juice cleanse courtesy of The Ripe Stuff … and I’m still here to talk about it. Much to my surprise (and MJD’s- he says I get #hangry), it wasn’t that bad. In fact, I kind of loved it-and felt amazing afterwards! 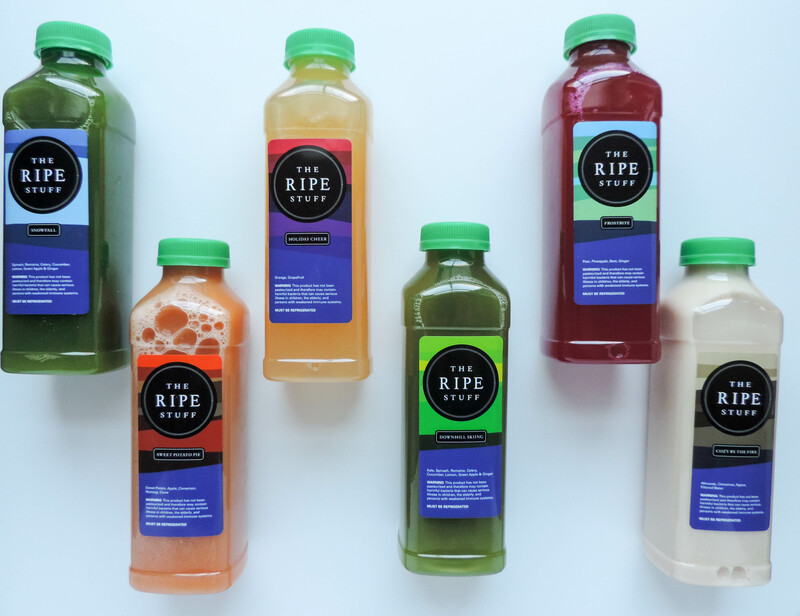 The Ripe Stuff is a Boston-based juice cleanse company that will deliver a one, two, or three day cleanse right to your Boston area home or office. Started by a fellow Holy Cross alum, I’ve always considered trying a cleanse through The Ripe Stuff, but never worked up enough courage to do so. After Rebecca and I exchanged a few e-mails, I knew I had to give it a try and I’m excited to share my experience with you too. If you have ever been interested in doing a juice cleanse, I’d definitely recommend The Ripe Stuff! Since The Ripe Stuff recommends cutting out alcohol, caffeine and tons of sugar out of your diet for a few days before you start the cleanse, I decided post-holidays was the best time for me to start. I scheduled a Monday delivery of my three-day cleanse which would allow me to start on Tuesday, January 5th. The Ripe Stuff offers delivery on Monday, Tuesday and Thursdays from 3-7 PM. The whole delivery process was really smooth. I asked for the 5-7 PM delivery slot because I typically am not home until around 6:30 from the office. It worked out perfectly as the delivery was dropped off in our apartment building’s vestibule right before I arrived. All the juice was packaged in a big box with some ice packs to keep it cold. It also included a small cooler bag which was the perfect size for a day’s worth of juice. Rebecca recommended I try their seasonal cleanse, the Winter Mix. As soon as she mentioned that it had a bit of variety to it, I knew it was the one for me. I definitely am someone who gets bored eating the same thing each day so I knew having variety in the juices would be key to me. I’d highly recommend their seasonal cleanses if you try The Ripe Stuff. While I can only speak for the Winter Mix, it was delicious and had enough variety to keep me from getting bored or frustrated with my options. So, how did I feel while doing the cleanse? On Day One, I was really surprised how long the first juice kept me full. In fact, it kept me fuller longer than my greek yogurt breakfasts do. I was seriously impressed! Day one for me was all about experiencing the flavors. Holiday Cheer offered such a nice refreshment as a morning “snack” and I loved having a “dessert” of sorts with Cozy By The Fire. I pretty much decided on Day one though that I loved Frostbite the best. It is an amazing mix of flavors and a bit on the sweeter side- which you all know my sweet tooth loved! Day Two I woke up feeling really refreshed. I slept really well and was ready to go for the day. The Ripe Stuff recommends only working out while on the cleanse if you feel like you have enough energy. They also recommend lower impact workouts. At end of day two, I felt like I had a lot of energy so I did make a quick trip to the gym and did a quick half hour on the Arc Trainer followed by some arms and abs. I felt okay to do this, but if you do a cleanse of your own make sure you only do what you feel comfortable doing! Throughout day two, I was still feeling satisfied by my juices and drinking water in between. Overall, I felt super satisfied during the entire cleanse! There wasn’t one moment when I felt like I was starving. In fact, with 6 juices throughout the day and the ability to drink water, hot water with lemon and tea in between, I had plenty of options as soon as I got hungry. No hangry moments for this girl (Yay!). At the end, I felt lighter and it was true, I lost a few pounds of water weight, but I know that’s not a long term effect. The real benefit I got out of the cleanse was “resetting” my body. After practically a month of holiday festivities, I was eating tons of sweets and “bad” carbs – things I wouldn’t typically eat every single day- and felt like I needed them. I also felt during that time like a bit of a bottomless pit. The Ripe Stuff Juice Cleanse helped me get rid of that feeling of needing and kind of in a weird way erased my prior cravings. After the cleanse, I’ve been trying to eat on the cleaner side. I think my appetite has been right-sized after the cleanse and got rid of that “bottomless pit” feeling. I can see myself doing a cleanse again after any period like that where I just need to reset and clean up my act. Boston friends, I’d absolutely recommend The Ripe Stuff cleanse for any of you who may be interested in a cleanse, or want to change your eating habits. I think this is a delicious, satisfying option to go with! 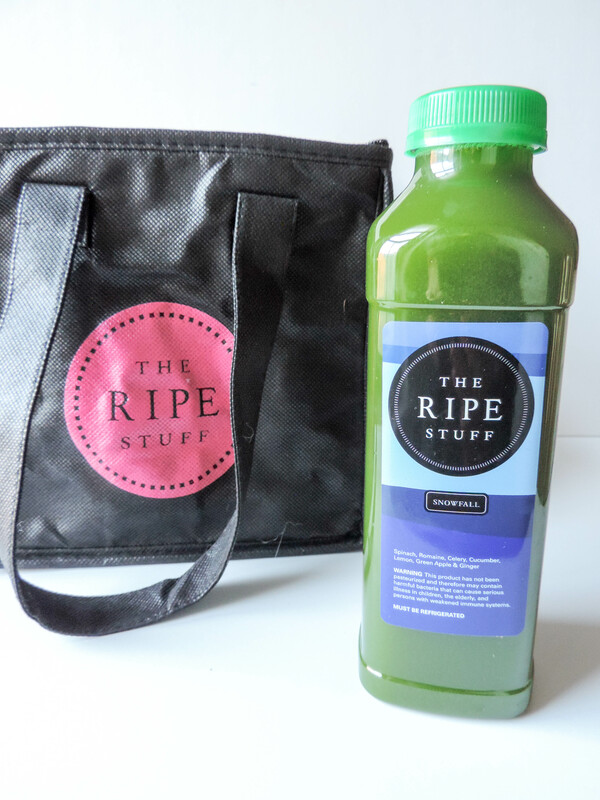 The Ripe Stuff is graciously offering free delivery to Boston Chic Party readers who want to try with the code: CleanseWithMe . So, what are you waiting for? Check out their site and give it a try! Your turn- have you ever done a juice cleanse? How did you feel afterwards? FYI: The Ripe Stuff provided me a complimentary three-day cleanse. All opinions and images are my own. I will go on juice kicks for maybe a day or two, but i never follow cleanse guidelines very closely. Have always wanted to try though so maybe I will give this one a shot! Ive never tried a juice cleanse but definitely considering this year! Thanks for breaking this down for us! Great post! I am hungry all the time, so I don’t know that I could do it! I would be up for adding some fresh juices into my diet for extra nutrition though! I’ve been looking into a juice cleanse and needed recommendations. I wish they were in the NY area as well. I’m hoping that there’s a similar service here. Thanks for sharing, you made me feel like I can do this now. This cleanse looks so healthy and delicious! I’ve been wanting to try one so thanks for all the info and sharing your experience! This is so neat! All those flavors look really delicious! I’ve been wanting to try a cleanse for such a long time! But I also get pretty easily #hangry… this one looks like it has such yummy flavors though! The flavors were delish and with enough variety to keep things interesting through out the day! I was filled up the majority of the time and shockingly, not one #hangry moment!